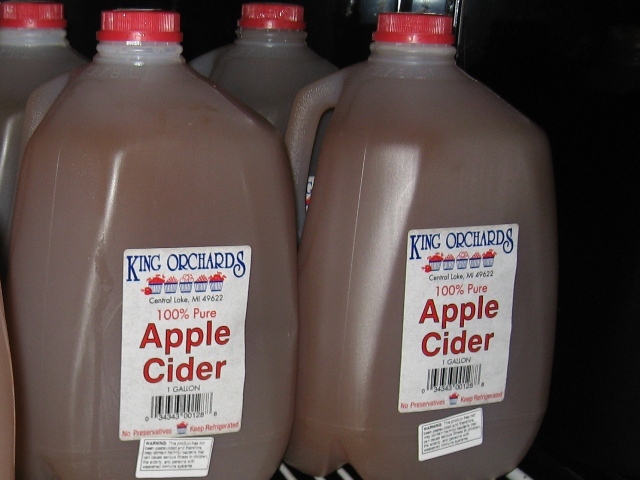 I was over at King Orchards buying more apples when John King told me the news. They were getting a cider operation going again. 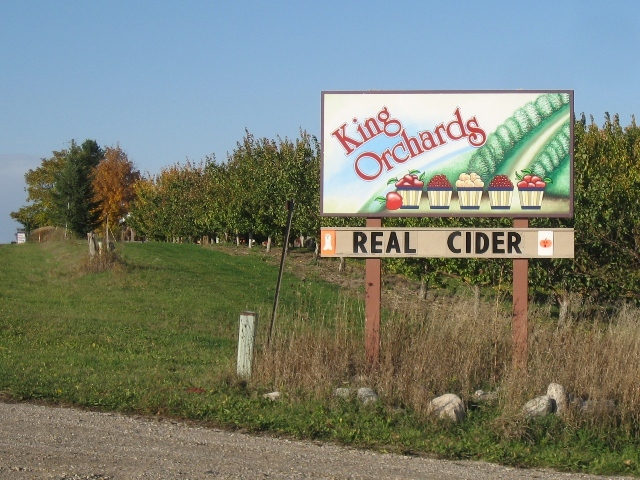 Now this is really news, because they used to make cider—and very successfully too—but decided if they were going to work that hard they might as well just go ahead and farm. We have progress – Apple Lift-off! Today I went back over there and guess what. 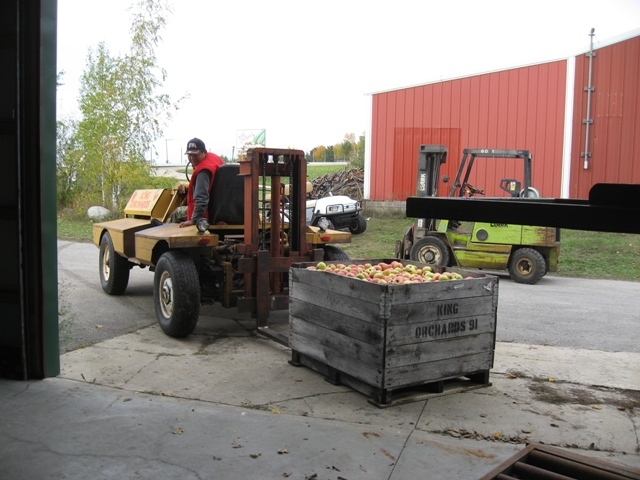 Yes indeed, the first 2012 pressing of Real Cider awaits you. This is unpasteurized cider. The good stuff. It is enough to make you weep with nostalgia for the rustling leaves of childhood. My assessment of the 2012 pressing? It pairs well with autumn, my very favorite time of year. Oh, doesn’t that sound good! I’m heading north this week – I don’t imagine I’ll find any cider in north Texas or Oklahoma, but it might be possible in Missouri. Last year, I found some in Illinois, and it was remarkable. So were the apple cider doughnuts, now that I think about it. If I find apple cider doughnuts AND cider – well! That would be worth a stop under a big maple tree for a little munching and meditating! You are still so green! Our grass is green, but we don’t have the green shrubs and trees that you do. The cherry orchards are nearly blaze orange at this point and the apple trees are yellowed. We have had rain. Quite a lot of rain, actually. It is not so much a matter of “still” so green as Finally!! Green!! – and then golden . . . 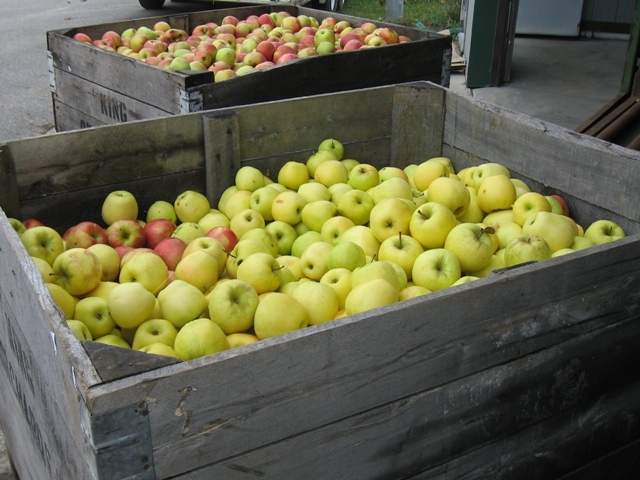 I love, love, love big wooden apple boxes full of apples! I especially love that I am not the one who had to pick the apples to fill the boxes! But that last image is the one that will (I hope) haunt my dreams. Changing the subject, David and I were in Traverse City today and visited Building 50, and as we strolled through the Mercado admiring the art, I recognized a big Margie Guyot painting at first sight! It had frogs and frog teapots and at least one florist’s frog, all on a bright tablecloth. I knew right away it was hers, thanks to your blog, Gerry. We both liked it a lot, too, so please tell her that. I will be absolutely sure to tell Margie that you and David liked her frogs! 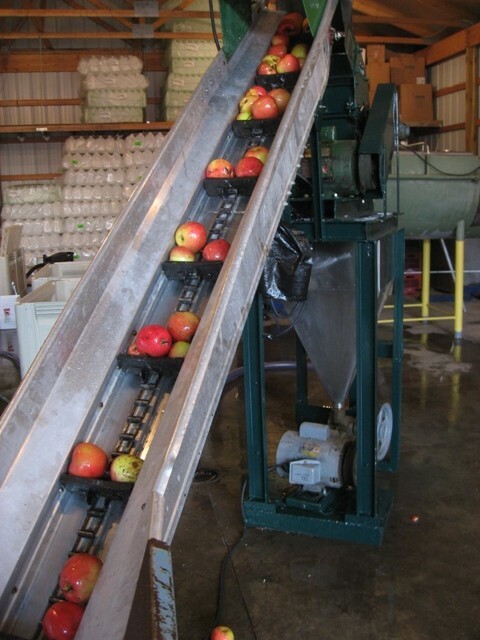 Love “apple lift off” …and you’ve got me salivating over here…sounds just wonderful! 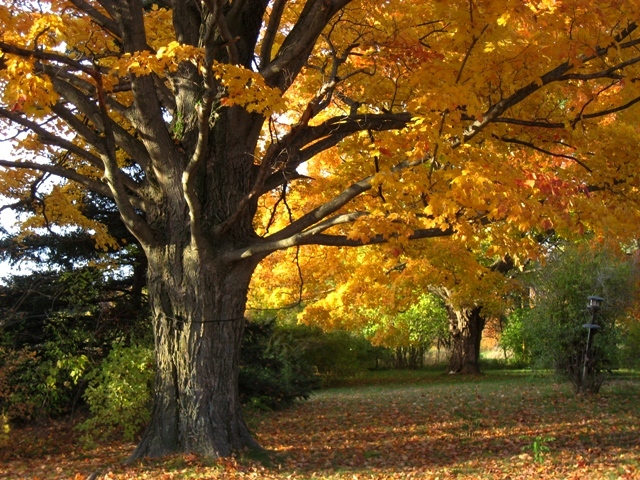 Beautiful fall photos, Gerry! And also lovely news. We don’t drink much cider, but when we do I want the good stuff, and now I know where to get it. 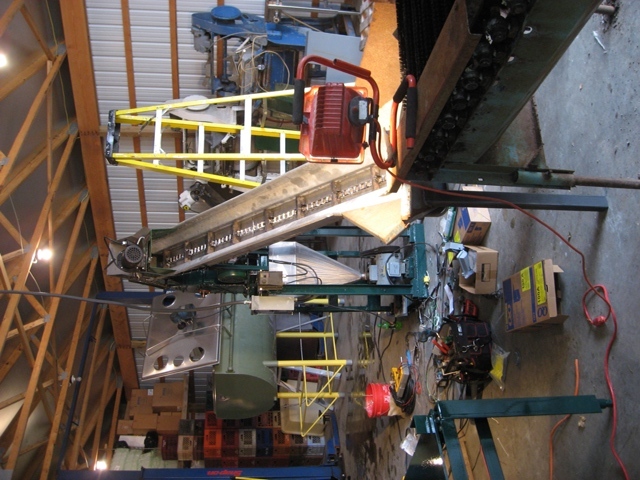 Cider and blogging, its global, so is cussing machinery. The cider I bought is not alcoholic, but it could be. I wonder if there’s a cider-making workshop over at Wagbo. Hmmm. Maybe I will try parsnip and cider soup. I found a recipe that calls for bacon garnish and milk and yogurt as well as chicken stock and apple cider. I look forward to the day you visit the ancient cider press. What do they do with the leftover pulp? Seems like they could either get into the pig food business, or strain out the seeds and make apple butter. . . .? You have asked an excellent question. I will hunt up a worthy answer. Mmmmm, real cider! You don’t see the unpasteurized stuff all that often. 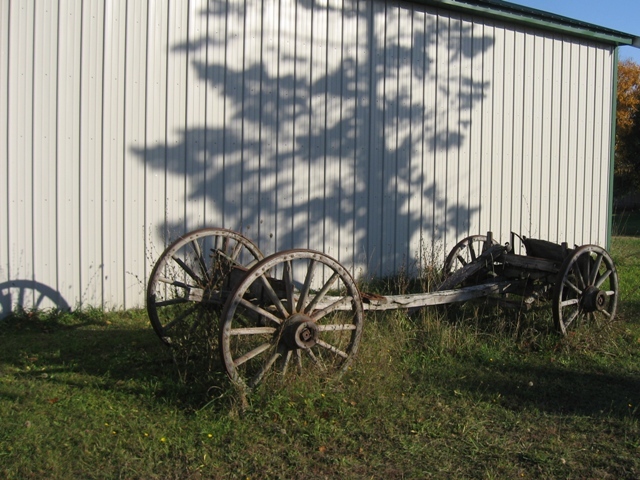 Once upon a time during my days working at a living history museum, they would get the horse-or-ox-drawn cider press working. Always smelled delicious. The real cider is delicious, we are fortunate to get some here also. The last image of you Fall leaves are beautiful. Thank you, Nye – I really enjoyed taking pictures of Bertha’s trees on a sunny afternoon. Been drinking our NY Apple Cider for the past month. So, so good! Cheers as we clink our virtual cider glasses together. Nice to have at least one excellent treat arrive in its season, isn’t it! Here’s to you, New York.